Would they have been marked with something e.g. broad arrow and WD ? This is something I have wondered about - a few of the reconstructions I have seen, often models, but also the museum at Rorke's Drift (as far as I can tell from a photo) have the broad arrow and WD on the sacks; I always assumed that the bags would have been bought, ready filled with mealies, from local contractors and farmers - would some poor soul really have been given the task of stamping them all? Artists' reconstructions tend to show the coloured stripes running along the length of the fabric, which seems to be common on old grain sacks. As to the size, I'm sure I've read 200lb as the weight, which seems awfully heavy, but a good sense of the size is shown in the photograph of Fort Northampton near RD in 1884 (P.150 of "Nothing Remains but to Fight"). Does anyone know if it was standard practice for the commissaries to stamp locally procured supplies? Just a thought, but perhaps the bags were shipped empty from stores in Britain and filled "in country" in which case they would already be stamped with the broad arrow when they arrived. I'm thinking that it's the bags themselves that are accepted by the War Department, not the contents. Different colonies would fill the same style bags with their local produce-- mealy corn in South Africa, rice in India, wheat in Australia (was wheat grown in Oz?) etc. Some little information from Hook's account of the action: "The mealie-bags were good big heavy things, weighing about 200 pounds each ...The biscuit boxes contained ordinary biscuit. They were big square wooden boxes, weighing about a hundredweight each. The meat boxes, too, were very heavy, as they contained tinned meat. They were smaller than the biscuit boxes." I seem to recall having read somewhere that the tinned meat in the "meat boxes", a valuable but often overlooked part of the barricades, was supplied from Chicago. "Come all this way to get saved by a cow from Montana". Size? I would suggest the old one hundred weight sacks would be about right. Standard British sack size for grain etc of the period. My father often talks about handling this size sack on farms in UK in the '50s & '60s. I like those ideas - I had never considered that standard sacks were shipped across the empire ready inspected. It will certainly make a reproduction sack with arrow and WD more interesting and authentic looking than a plain old sack. Off hand, are there any other references to a weight of 200lbs? I know I've come across it more than once, but can't recall if they were repeating Hook's comment. It seems a huge weight to lug around by hand, and must be double the hundredweight standard sack just described, if my guess that a hundredweight is roughly 100lb is correct? (sorry, ever so slightly too young to have used Imperial weights much). I would have expected the English to use a "weight" with which they were familiar when packing grain in sacks, hence a "BUSHEL" which was used for "dry goods" is one which springs to mind. Some "Bushel" weights for grain in common use......"THEN"
Grain...... and weight of 1 bushel in pounds......... bushels to a sack. I just love "Olde English" usage"
Very interesting; so taking the numbers for maize, that would indeed make the sacks just shy of 200lb - a terrific weight for a sack. If most men could drag a sack that weight, I'd have thought that most would be hard pressed to lift it, or do much more than stagger if they did. Building the barricades must have been backbreaking. Sgt. Windridge slung two over his shoulders. Bah, I bet they were filled with styrofoam packing peanuts. ................ I'd have thought that most would be hard pressed to lift it, or do much more than stagger if they did. Building the barricades must have been backbreaking. From my days in a warehouse where most agricultural goods in sacks weighed in at either 25 kg or 40 kg, then I don't see those weights as too much of a problem. Consider.......lets say, for the sake of convenience, that 40 kg = 80 lbs, then as I could lift and carry 40 kg's by myself, two men could certainly handle 80 to 100 kg's between them. And before anybody points out that the male of 1879 was slighter than I, I make the point that they were probably fitter. The size, appearance and any markings on the mealie bags used in the Rorke’s Drift barricade are obviously important points to establish for makers of models and dioramas (and probably even for some of the rest of we anoraks!) and I had a vague idea that there had been, somewhere, a description of them in at least one of the dozens of surviving eye-witness accounts, of which some are clearly more reliable than others. I can’t remember which, however, and I’m not going through them all now! We haven’t got a contemporary colour action photograph taken at the time of the engagement, but there are two near-contemporary contributions which, surely, can be considered the next best thing. De Neuville and Lady Butler both went to great lengths to ascertain minute details for their works and both offerings were characterised at the time as being as accurate as the artists could possibly make them – one for the Fine Art Society and, through this body, the British public and the other, of course, for the Queen. Both artists made a point of speaking to participants. De Neuville not only interviewed Chard, Reynolds and Smith (the officers present who independently produced the three most detailed reports on which we rely today and have done for 130-odd years) but examined Chard’s sketches, as well as “the plans, drawings and notes made on the spot by Col Degacher the day after the action.” Being an old school chum of Degacher, we can assume de Neuville felt he could question him about his sketches without inhibition. He met the returning 24th at Portsmouth and he received lengthy correspondence from Harry Lugg. Accuracy and attention to detail were clearly going to be paramount. Degacher’s coloured sketch of part of the barricade, which de Neuville used when planning his painting, shows four biscuit boxes and well over a dozen sacks jammed into the spaces beneath, around and on top of one of the wagons. Any questions about the actual size of the sacks when filled can be answered by this illustration, drawn from life within hours of the action and additionally helpful by our being able to compare them with the known size of the wagon. With regard to any markings on either sacks or boxes, Degacher included none. Looking at this well known sketch, it could be argued that he paid more attention to their outline than to texture or markings, but it seems certain that de Neuville discussed their appearance with him before painting his own bags and boxes. Because de Neuville’s composition views the action from within the perimeter, we see only a handful of filled sacks scattered in disarray. But they are in the immediate foreground and they are painted in sufficient detail to clearly indicate their size (and perhaps even weight). They are close enough for us to examine carefully the stitching, the colour, stains, smudges and even stitched repairs. There are no markings at all on de Neuville’s mealie sacks. Four or five large, wooden boxes, identically shaped and sized, also litter his foreground, the nearest of which bears the words “Commissariat - Navy Biscuit” stamped or stencilled on its side. To me, this smacks not of artist’s licence but of authenticity, given that these are not necessarily the words the public might initially have expected to see. De Neuville had already spoken to those who knew. 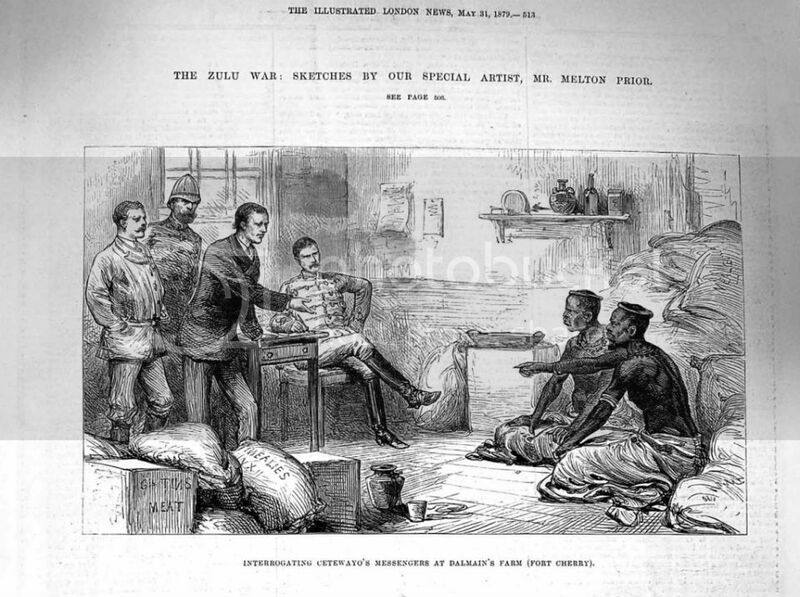 But what also seem to be the words “Rorke’s Drift .. Natal” might appear to question this supposition – this time suggesting licence – especially as between these words the semblance of a possible date can just be seen, indicating 22 or 22nd! If so, perhaps the artist included this “symbol” as some sort of historical signature to his composition? In the second of these 1880 “heavyweights”, Lady B depicts boxes in only the far distant background, alongside the mealie redoubt, so no conclusion can be drawn from her work on this point. However, very prominent in the close foreground are four or five large mealie sacks, and these appear to be completely plain apart from the one protecting John Williams/Fielding. It seems to be stamped with the letters “S O” or perhaps “S C” – or, if we’re meant to look at it upside down (why not?) perhaps even “P S.” Any guesses on the meaning of these letters? Just as interesting in her painting of the sacks is another distinctive marking on all four bags running along the top of her foreground perimeter. She depicts three thin, parallel lines, a central blue (possibly black?) one between two red ones running along the whole length of each sack. This may, or may not, be intended to represent stitching – at least the central, darker line might - but I doubt it. The lines are quite carefully and deliberately included on each nearby sack, including the one underneath a wounded soldier, far right. Has this eminent artist, in a painting well known for her attention to detail, suddenly made these lines up? Or has she spoken to someone who described them? Or if she, too, has decided to include a symbolic marker for her patron, The Queen, did she choose these red and blue lines for that purpose? By coincidence, Gibb’s “The Thin Red Line” was being painted at that very time! Although it’s impossible to say the evidence in the two famous paintings is proof, the fact that they were both described at the time as remarkable attempts at accurate and realistic depictions and because so many participants in the defence were consulted, I believe the portrayals by de Neuville and Butler are far stronger arguments for the absence of stripes, arrows or WD markings on the sacks, than any contemporary attempts - whether by modern museums or otherwise - to suggest it is reasonable to include these features today simply because they seem a good idea now or the sacks may just have been so marked. If model makers or diorama creators are looking for authenticity, it’s pretty clear who they should follow in the absence of strong pointers from other sources. P.S. By the way, all the paintings I’ve mentioned above can be examined and compared easily in the colour reproductions in Ian Knight’s Nothing Remains but to Fight (1993) - which many here will have - apart from Simon’s, which is of course available on this forum. P.P.S. Yes, a hundredweight (cwt) was – and still is, I hope – 112 lbs. Are we to understand, then, that 7 and 8 year olds no longer begin their daily lessons by chanting in unison these measurements in front of their teacher, who looks on menacingly with sharpened ruler in hand, ready for use? Such methods do work – to this day I can unhesitatingly calculate weights by ton (note the spelling), hundredweight, stone, pound and ounce, or answer how many yards, feet and inches there are to a mile or square yards to an acre, which indispensable knowledge has since propelled me far! Although we are endlessly harangued these days by those who are persuaded that mysterious and alien inventions such as kilos or centimetres could some day be quite useful, I have no problem whatever with all these admirable calls for international "harmonisation" of all measurements, and look forward with alacrity to assisting the mathematically challenged from overseas as they finally fall into line with the wonders and charm of avoirdupois. They’ll love it! And by the way, where have all our florins gone? The country’s going to the dogs! Just a point of interest I made some bags for a show display. I had originally tracked down coffee bags to save myself some time and to my surprise they had blue center and red outer stripes that were actually part of the bag (not painted on). Although time consuming it was cheaper for me to make my own. I had always thought that was correct but looking back I believe that was because of Lady Butler painting. I wanted to add the WD not being 100% sure if that was correct but more or less that it seemed like that would catch people’s eye. I looked through period sketches and found a couple from Melton Prior with writing and WD broad arrow on them so I added them to mine also. Lloyd writes about the bags in A Soldier Artist in Zululand and even sketches them but unfortunately it is not one of his water color ones. I think if you try to trick your eyes you can see deliberate lines through the bags. Anyway, good luck with your project. 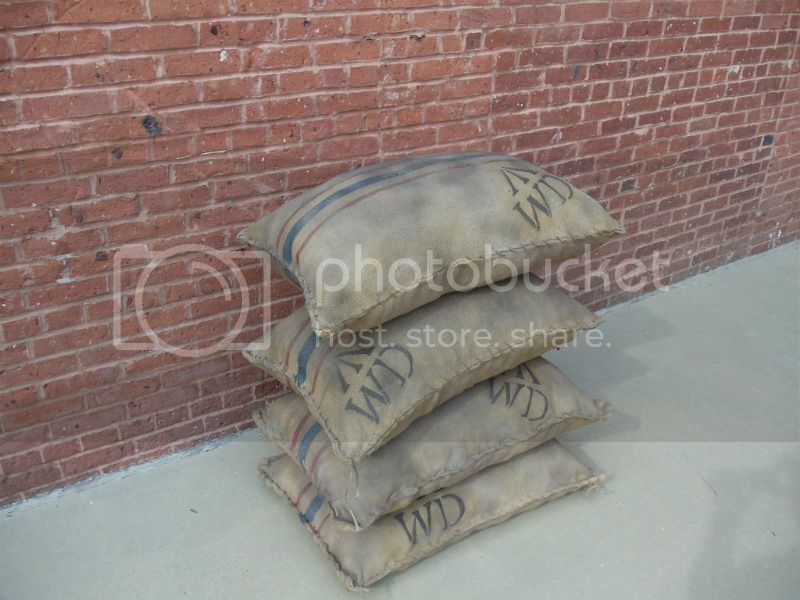 Right or wrong, Jeff, I think the sacks look marvelous. I had also been having a flick through the ILN and Graphic engravings for a clue - the famous picture of the fellows in shirt sleeves entrenching a laager by Fripp also seems to show an arrow on one of the sacks on the far left hand side. Difficult, of course, to know how much of that was the engravers at home embelishing the picture, but it would seem a mundane detail to add on a whim. Also, of course, not all of these are necessarily mealie sacks - one of the ILN illustrations is marked Flour, but sacks with the arrow do seem to have been commonplace, or at least commonly expected to carry it. With regards to the Navy Biscuit detail on the boxes, discussed above, I have also always thought that an intriguing detail to add without good reason and always holds my attention when I look at the picture. If I ever get hold of a nice wooden crate, I think I'll be helpless to stop myself stenciling it on. @ Jeff, it is exactly the same bags in your colour picture I can get hold of.